We LOVE homemade pizza night at our house! We use my Pizza Dough that is virtually fool proof and pizza night is perfection! This sauce is SO flavorful and delicious! 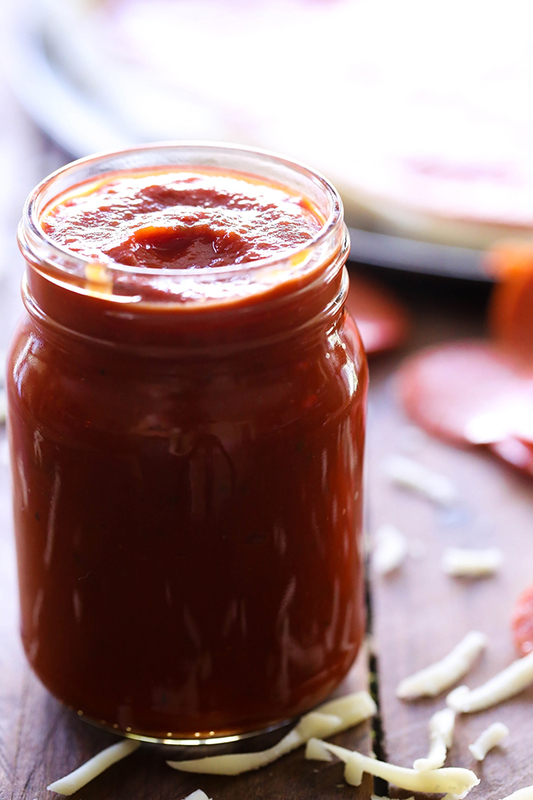 It makes a great pizza sauce or dipping sauce. My kids and hubby go crazy for this recipe and I know you will too! Give it at try at your next pizza night- you won’t regret it! This sauce is phenomenal! It is super simple to make and has the most amazing flavor! Combine all ingredients in sauce pan and bring to a boil over medium heat. Cover pan and reduce heat to low and simmer for 30 minutes. This looks like a very smooth sauce. It sounds delicious and great for dipping cheesy breadsticks. I use your pizza dough recipe evey week here at our house, and I'm sure your sauce will be a great addition to our pizza night. paste :) Thanks for catching that! may i know how long can i store this sauce in the fridge? Is the red pepper diced fresh red pepper? Red pepper flakes? Looks nummy! Hi! Think this sauce would be good made in batches and froze?? It would be cute left in mason jars also but for freezing my guess is the plastic freezer containers may be best. Ideas? Have you froze this?? Thanks!! I am making this Pizza Sauce Recipe right now, I just put all the ingredients in my saucepan, but I am so surprised that there isn't any Italian Seasoning in the recipe, Hmmm! !